Previous / Next: Picture Gallery / Juania Australis - A first ever - and it's a girl! To the north of the garden, the Hill of Howth provides important shelter from cold northerly winds. On the south side the land extends down to high watermark. This fortunate situation along with the influence of the warm North Atlantic drift is responsible for the favourable microclimate. Air frosts occur regularly generally between early December and mid April. The lowest winter minimum is usually about -4º C but more severe frosts occur from time to time and we recorded low temperatures of -7.5º C in December 1995 and -7.0º C in December 2000. Freezing days, when the temperature does not rise above 0º C, are rare. Because of the proximity of the sea, summer temperatures are moderate, seldom exceeding 25º C. The absolute maximum recorded since 1969 was 28.9º C in July 2016, though this level of high temperature is very rare. Average annual rainfall is only 650 mm but this is spread fairly evenly throughout the year and periods of drought are rare. Although rainfall is among the lowest in Ireland, the coastal location is responsible for relatively low daily maximum temperatures. Consequently drought is seldom a problem, the top soil remains relatively moist during the average growing season and trees and shrubs produce a preponderance of shallow, surface feeding roots. The soil is derived from Cambrian shale and quartzite. These are hard rocks and have enabled the peninsula to withstand the eroding action of the sea for millions of years. Had the peninsula been derived from limestone like most of the rest of County Dublin it would have been washed away long ago. The soil in the garden contains approximately 25% clay and 4.5% organic matter in the top 8 cm. It is mostly acid to neutral (pH 5.0 - 6.5) in contrast to the alkalinity of most of County Dublin. Under these conditions and with the help of many organisations such as the National Botanic Gardens Dublin, Edinburgh Botanic Gardens , the UK Royal Horticultural Society and Abbey Gardens, Tresco, Isles of Scilly a large range of Climatic Zone 9 plants has been assembled. To obtain uncomplicated information on plant hardiness, no protection of any kind is given in the winter. Fingal is an administrative area of County Dublin. The administrative area of Fingal is located to the north of the City of Dublin and extends in the west to the line of the River Liffey, to the east to the sea and to the north as far as the county boundary. It covers an area of approximately 173 square miles and has a population of almost 210,000 with growth projections to 260,000 by the year 2010. 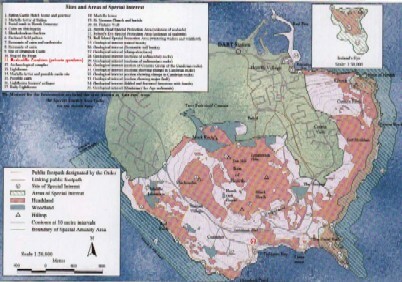 In 1999 Fingal County Council recognised the exceptional character of the area of Howth by making the Howth Special Amenity Area Order. The Howth Order was confirmed by the minister on the 16th May 2000. Fingal County Council have listed the garden at Earlscliffe by name as a site of special interest that has to be maintained under the Howth Special Amenity Area Order. 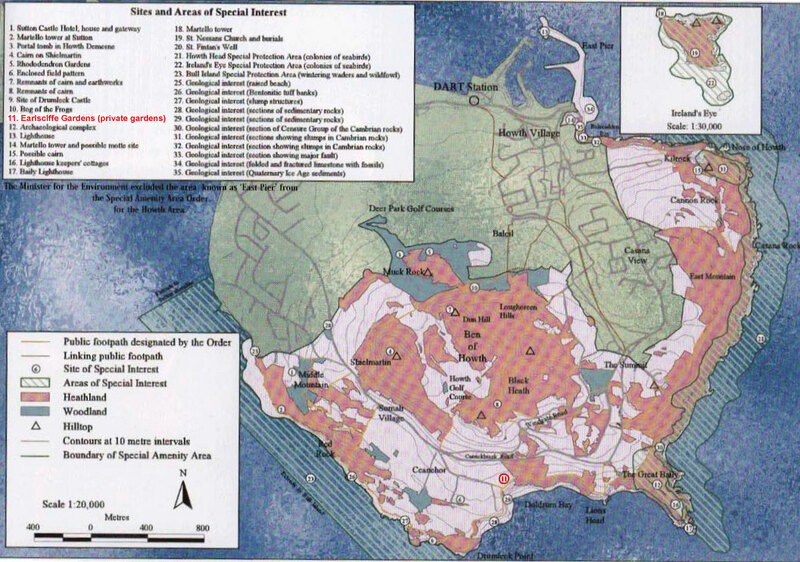 The Howth Special Amenity Area has a total area of 547 hectares. This comprises Ireland's Eye (28 hectares) and the heathland, woods, cliffs and wooded residential areas of the south-eastern half of the peninsula (519 hectares). The order designates a 21 kilometre network of rights-of-way as public footpaths. Every large area of heathland and woodland on the peninsula can be reached by these paths. If the property is included in the area of the SAAO for Howth then the exemptions from planning permission under Class 1 of the Planning & Development Regulations 2001 do not apply. Howth Head displays a fine range of natural habitats, including two Annex I habitats (sea cliffs and dry heaths), within surprisingly close proximity to Dublin city. Annex I habitats are defined by the EU Habitats Directive as natural habitat types of community interest whose conservation requires the designation of Special Areas of Conservation. The site is also of scientific importance for its seabird colonies, invertebrates and lichens. It also supports populations of at least two legally protected plant species and several other scarce plants. Rock outcrops which are important for lichens are distributed widely around Howth Head. The richest area for lichens appears to be around Balscadden quarries. In addition, the Earlscliffe area is of national importance for lichens and is the type locality for the black, yellow and grey lichen zonation. A number of Red Data Book plant species, which are legally protected under the Flora Protection Order, have been recorded at this site - Green-winged Orchid (Orchis morio), Bird's-foot (Ornithopus perpusillus), Hairy Violet (Viola hirta), Rough Poppy (Papaver hybridum), Pennyroyal (Mentha pulegium), Heath Cudweed (Omalotheca sylvatica) and Betony (Stachys officinalis). Curved Hard-grass (Parapholis incurva), a species which had not previously been recognized as occurring in Ireland, was found at Red Rock in 1979. The site is of national importance for breeding seabirds. A census in 1985-87 recorded the following numbers: Fulmar (105 pairs), Shags (25 pairs), Herring Gulls (70 pairs), Kittiwake (c.1,700 pairs), Guillemot (585 birds), Razorbill (280 birds). In 1990, 21 pairs of Black Guillemot were counted. Preregrine can also be found as well as Sparrowhawk and Kestrel. Howth Head is also good for seawatching (Shearwaters and Skuas) and the Head also throws up some interesting migrant passerines e.g. Pallas' Warbler recently. A number of rare invertebrates have been recorded from the site: the insect Phaonia exoleta (Order Diptera) occurs in the woods at the back of Deerpark and has not been seen anywhere else in Ireland, while the ground beetle Trechus rubens (Order Coleoptera) is found on storm beaches on the eastern cliffs. A hoverfly, known from only a few Irish locations, Sphaerophoria batava (Order Diptera) is present in the heathland habitat within the site. The main land use within the area is recreation, mostly walking and horse-riding, and this has led to some erosion within the site. Fires also pose a danger to the site. There may also be a threat in some areas from further housing development. Juania Australis - A first ever - and it's a girl! This page was last updated on 26-Feb-2019.